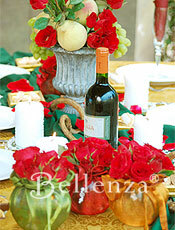 Home / Decorating Ideas / A Romantic Tuscan Wedding Tablescape: Inspired by Wine! A Romantic Tuscan Wedding Tablescape: Inspired by Wine! 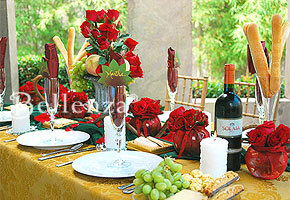 Sophisticated reds, greens, and gold combine with natural and earthy tones for that rustic elegance typical of Tuscany. But just what is “Tuscan style”? It is elegant, yet rustic and charming. Also, it is warm, passionate, and full of a love for life. How does one recreate it? First, by finding the ideal location. Then, by selecting classic Italian decor elements, and presenting and combining these in new and unusual ways through the occasion’s color scheme, table decorations, and centerpieces. The perfect location for a Tuscan-inspired party theme would be an al fresco venue, surrounded by lush greenery that naturally sets a relaxed, inviting atmosphere. An expansive vineyard with a spectacular view is an ideal choice. But if one is not available, other options are a stone veranda of a hilltop home nestled amidst green trees, an inner courtyard of a villa with authentic Italian architecture, or a rustic barn or cottage. The key is to assemble the table elements in a seemingly random fashion for a warmly inviting look. Colorfully wrapped vases bearing red roses are one example. Alternatively, recreate the look and feel of a vineyard by setting up vertical trellises bearing plants around the venue, or positioning smaller ones above the tables and embellishing these with bunches of grapes and grape leaves. Location is only the beginning, though, for a Tuscan-themed event. The right medley of colors takes this setting to the next level. Deep, rich tones dominate a table display inspired by Tuscany. Shades of green and earthy hues call up images of its landscape and architecture; while burgundy and gold bring to mind the classic red and white wines that this region is known for. The natural tones of wood, wicker, and straw recall the rustic elements of the Italian countryside. Choose an al fresco venue with a relaxing and spectacular view. Paint a Tuscan scene with deep, rich tones in shades of red, green and earthy hues with a dash of gold, while applying rustic elements. Create a centerpiece with natural elements using shapely fruits amid the traditional roses. Present an interactive table display where food plays a role in the decor. 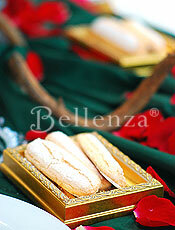 Thank guests with Italian treats presented elegantly: see example. The stunning effect of these rich reds, greens, and golds can be brought to a table setting through elegant fabrics and decorative accents. A gold brocade tablecloth, for instance, can provide the canvas for the entire display, complemented by a hunter green table runner and wine-colored napkins. Gold accents, such as miniature frames doubling as trays for treats, are reminiscent of the beauty and splendor of classic Roman architecture and ornamentation, while earth-toned place cards in the shape of grape leaves make reference to Tuscany’s wine-making heritage. The key is to lay out all these elements in a seemingly random fashion for a relaxed, yet elegant feel—truly expressive of the classic, yet warmly inviting Tuscan approach to celebrating. And what better focal point is there for this arrangement than a dramatic Italian-style centerpiece? With Tuscany being also well known for its pottery, textured stone urns for each table’s centerpiece are beautifully apt. Blood red Grand Gala roses share the spotlight in each urn with a selection of fresh pears, blushing peaches, and succulent green grapes. The arrangement is classic in line, with the tallest element in the middle of the centerpiece and the other elements gradually decreasing in height on all sides—again creating a relaxed yet elegant look. The lighter hues of the fruits likewise provide a refreshing break from the strong reds and greens dominating the entire table. Aside from fruits and flowers, natural elements such as wood and straw also feature prominently in Tuscan decor. Thus, a length of woody vine laid alongside the centerpiece plays up this tradition, as it evokes the grape vines of the region. And finally, textured rose candles set atop pearl-decorated candle plates nestle amidst the table decorations—another example of that distinct blend of elegance and rustic charm. Adding attractive and edible elements is the next step in making the table scene really come alive with the spirit of Tuscany. The play of colors and textures in a platter of cheese, grapes, biscotti, and chocolates makes them a visual treat as well. Wine and Breads on Display – Bottles of red or white wine—personalized and beribboned, perhaps?—will work both as table accents and, of course, as a glorious accompaniment to the meal. Freshly baked breadsticks placed in a champagne flute add height to the table display and a light, natural hue to balance the setting’s rich reds and greens. They also capture the theme of “rustic meets elegant”—common breadsticks in a chic flute. Alternatively, serve freshly toasted breadsticks or rolls shaped like twisted ropes in straw baskets, accompanied with small bowls of dips like balsamic vinegar and olive oil or marinara sauce. Gold frames serving as miniature cookie trays pay tribute to the elegance of Italian decor. Plates and Trays of Goodies – An appetizing selection of cheeses, fresh grapes, biscotti, and chocolates can be arranged on a simple glass plate. Other favorite antipasti choices, like pecorino cheese combined with melon slices and cold meats like salami and prosciutto, crostini topped with chicken paté or bruschetta, and olive tapenade, may be presented on one large tray or on individual platters. Mini pizzas and mini calzones with assorted toppings and fillings make delightful finger foods, while pasta shells in decorative shapes and colors add to the visual and edible feast with a selection of tomato- and cream-based sauces. Cookies Presented in Style – For a sweet treat, a few pieces of cookies can be laid out on gold leaf frames placed amidst the table elements, the gilded design of the frames in keeping with the elegant Tuscan-inspired theme. 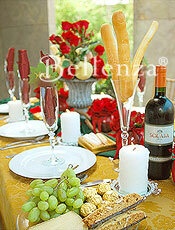 Italian treats displayed gracefully provide a personal touch to each place setting. Colorfully wrapped amaretti cookies may also be displayed using antique glass containers, such as clear Depression glass plates, quaint Hobnail sherbet glasses, or simple kitchen ceramics or canisters with a rustic look. At the end of the party, send the guests off with delicious goodies such as espresso-flavored cookies, biscotti, or cavallucci. As an interactive favor presentation, large glass bowls or vases can be filled with classic confections such as amorini hearts, chocolate hazelnut truffles, and white jordan almonds. Tuscany is such a treasure trove of event and decor concepts that it’s highly likely that the usual ideas have all been tried before. The challenge then is to discover fresh and unique presentations and combinations of Tuscan elements that will make a celebration truly one’s own. Start with a perfect venue, then proceed with colors, table settings, centerpieces, food items, and favors that evoke that relaxed-yet-elegant quality that typifies this well-loved region of Italy. This is a very romantic theme. Also ideal for fall weddings. Roses are also my favorite because of their many varied hues. Burgundy is for me! Those organza wrapped vases are great! How do you create them? Hi Claudia. All you need is a 17″ wrap and a glass bowl (fish bowl shaped) to create them. 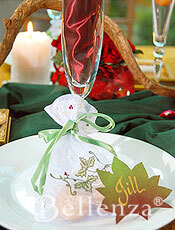 It’s very easy to prepare and you can mix and match colors based on your wedding’s color palette. My favorite is using aqua and burnt orange. If you are having a fall wedding, I recommend red and olive, or you can also incorporate a shot of fuchsia and burnt orange. This is such a great idea for decorating a Tuscan-inspired wedding party. You can even extend this idea to having a nice dessert spread filled with all sorts of yummy Italian desserts, pastries and chocolates. I’m thinking of cannoli, tiramisu, and spumoni! Oh yummy. I would like ideas for a tuscan themed wedding in purple and orange colors. 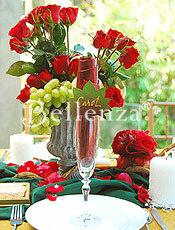 We are planning a New Year’s Eve party with the theme “A Night in Tuscany”. I am planning a Tuscany theme 40th birthday for my sister! We are having it outside…. (if the weather allows). It will be centered around ”WINE”. I f you can give me any other ideas it would be much appreciated! THANK-YOU. Ah, what a wonderful theme! Reminds me of the movie “Under the Tuscan Sun” which is a great inspiration for planning this Tuscan theme. From the land of the Chianti, incorporate touches of this wine everywhere. I’m looking at a sunny palette of hues such as orange, yellow, and ivory contrasted with green touches. Think of table decorations using rustic yet elegant details like centerpieces made of bright, yellow sunflowers and/or orange zinnias. And if you want some candlelight, simply add tealights housed in votive glasses. Make it look natural by adding fruits such as peaches, grapes, or apples. Since it is all about wine, place real bottles of wine everywhere! After all, you’re talking about an al fresco style setting! Then for your place settings, use lovely plate chargers made of straw, bamboo, or something neutral colored. If you want it to remain simple, crisp porcelain plates work just fine without chargers. Food will also be a big component of your table decor, so shapely breads, cut cheeses, and bottles of olive oil and balsamic vinegar should aslo be displayed for guests to freely serve themselves. Ultimately, the key is to make the scene look hospitable and inviting!